One of the things that most encourages me about our annual diocesan Synod is that so many choose to come and join in. We have about 175 clergy and lay delegates present, but usually twice as many attend simply because they want to be there. The feedback we get is that people are uplifted by the worship, challenged by the preaching, strengthened by the teaching and nurtured by the fellowship. the six breakout sessions on Saturday afternoon. Conversation on Race and Grace: Race issues have become contentious and difficult to talk about, so how can I and my church deal effectively with racism? How can we, in some way, be agents of change and reconciliation? Are there prejudices in my own life of which I am unaware? How can I deal with that? Join the conversation. Tom Tarrants is the Vice President for Ministry & Director, Washington Area Fellows Program at the C.S. Lewis Institute in Washington, D.C. He is a former Ku Klux Klan terrorist. He was ambushed by local police during a planned dynamite bombing at the home of Mayer Davidson a leading Anti-Defamation League official in Meridian, MI. He was severely wounded in the attack and later served eight years in prison. While in prison he came to Christ and renounced his racist beliefs. 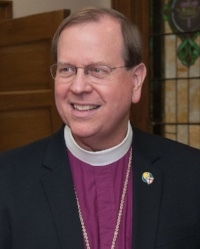 Tom has served as co-pastor of Christ Our Shepherd Church in Washington, D.C. and as a member of churches in our diocese, most recently The Falls Church Anglican. He currently attends Alexandria Presbyterian Church. He is the author of two books, and consults with churches and organizations seeking to develop discipleship programs and materials to strengthen the local church. Tom holds a Master of Divinity Degree, as well as a Doctor of Ministry Degree in Christian Spirituality. Synod is not only for clergy and delegates, anyone in the diocese is more than welcome to attend and see what we’re all about. You need to register if you would like to attend the Pre-Synod Session on Friday, November 17, 3-6:30 p.m. – Making Disciple-Making Disciples. Dinner is provided afterward for those attending the session who indicated on their registration they wished to be included in the dinner count. The Pre-Synod Session is open to everyone - You do not have to attend Synod to attend this workshop. Clergy and delegates must register so that ballots can be prepared for them. If you would like to attend Synod as a guest or observer and stay for lunch on Saturday please register so we have an accurate count for lunch. There is no charge for this event. Everyone who registers will receive a nametag and packet. No registration is needed if you only plan to attend the Friday night Eucharist or the Saturday breakout sessions. You also do not need to register if you plan to just drop by to visit the exhibits. The cost is $92.00/night plus tax and includes breakfast. We look forward to seeing you at Synod 2017! Lisa Anderson is the Event Coordinator for the Diocese of the Mid-Atlantic.